Whether you’re vegan, vegetarian or maybe you just want to find out more about the craze that’s been sweeping the nation throughout this “Veganuary”, join us as the fair sprouts up in Abergavenny for the very first time. Taking place on Sunday 26th May 2019, the Vegan Fair will be taking over the town’s Market Hall to showcase some of the best vegan products from the local area, as well as a hand-picked selection of ethical brands and businesses from across the country. Everyone is welcome to come along and enjoy the delicious food, fabulous stalls and positive atmosphere. The Abergavenny Vegan Fair will be a day-long celebration of all things plant-based including ethical clothing brands, cruelty-free cosmetics and skincare, eco-friendly household products and of course an impressive line up of delicious vegan food for you to munch on throughout the day or take home to loved ones. 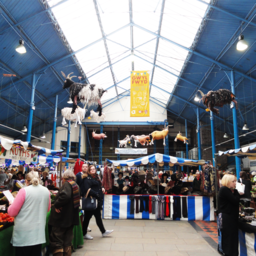 As well as a host of traders for you to browse and discover, revellers will also be able to enjoy a programme of talks, cookery demos and workshops taking place around the Market Hall for you to get involved with throughout the day. Veganism, as a sustainable way of life has become an unstoppable energy with especially huge growth in demand in the cruelty-free food market. The Number of Vegans in Britain has risen by 360% in the last 10 years and over a quarter (28%) of meat-eating Brits have chosen to actively reduced or limited their meat consumption in the last few years. Plant-based living is rapidly on the rise as people discover how they can live a healthier and happier life. Whether you’re looking to continue living the Veganuary lifestyle, buying a gift for a loved one or simply intrigued, come and join the Abergavenny Vegan Fair this Spring. A great day out for all to enjoy, so bring your family and friends. Vegans, vegetarians, flexitarians, pescatarians, omnivores and just the curious – all welcome! The Abergavenny Vegan Fair will be taking place on Sunday 26th May 2019. Previous ArticleGreen Man 2019 Line-Up Is Announced!